Midway Sealcoating and Striping Co concentrates on asphalt striping, crackfilling and sealcoating services for Arlington, Dallas, Forth Worth and surrounding areas. Midway Sealcoating and Striping has been Eastern Texas' most trusted source for asphalt striping, crackfilling and sealcoating since 1979. 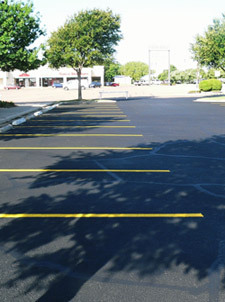 Our services include virtually every facet of sealcoating and asphalt striping. Whether you require preventative asphalt sealcoating services or crackfilling and maintenance, Midway will gladly address your needs with customer care and expertise. Please explore our website and Request a Bid on Sealcoating & Striping. Looking for expert sealcoating, crackfilling and striping services? Look no further. Please call us at 817.467.7003 or fax your requests to 817.465.1665 to reach a member of our team.